Home » Forums » Public Access » Chit Chat » IN SOOOOO MUCH PAIN! ok so my back is killing me! this took alittle over 8hours to tat in 2 days coast only $220 for the whole thing ! ...and its not even a frog, is it? amazing - nice tatoo there frogger! 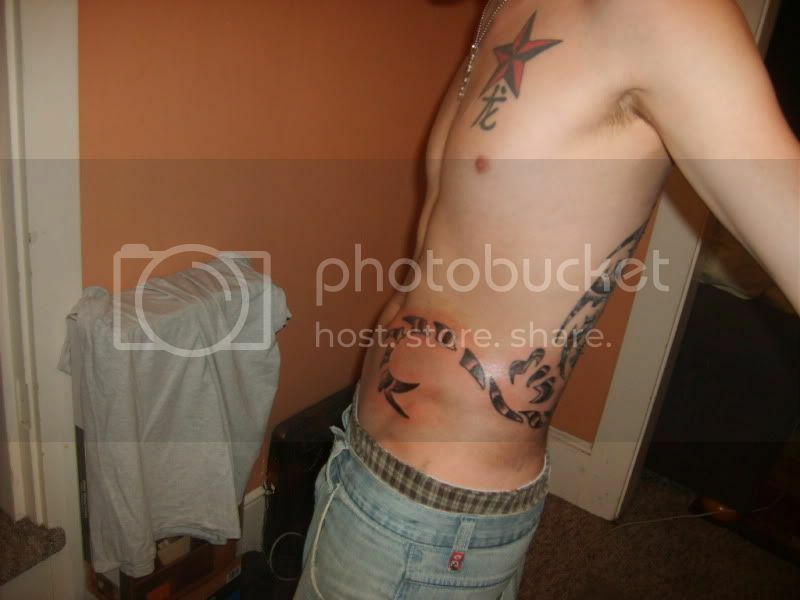 I'd say that tatoo is worth the pain and well worth the $220, looks good. Dang there Frog, I say Ouch just lookin at that, I couldnt handle it myself, Shoot I run when my doctor comes out with a Dart. I don't think I should say what I'm thinking, so I'll just say, enjoy lol. 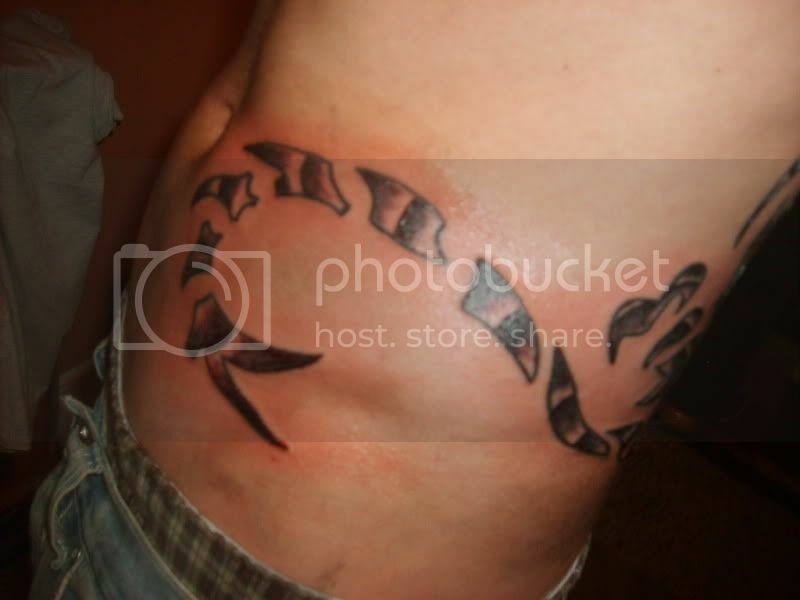 Nice tattoo Frogger, I hope you thought this one through! Tats arent a good thing mate. Too late now. Spawn could you slap his back for me lol. Yes, as a number in the ear of a dog, cat or cow. Not really sure why Hunter.. not seen in a negative light any place I've been so far. I am not a fan of tattoos myself and know what word Hunter is talking about. What I don't like personally are unimaginative Tribal things on the back. Its often seen in combination with sloppy clothes and badly chosen makeup. 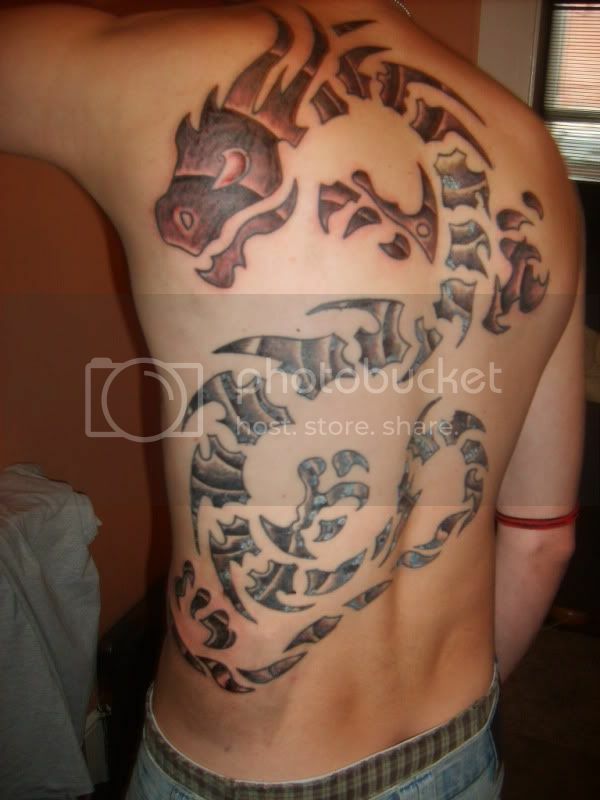 So these kinds of tattoos have a stigma and are not really considered body art. I never got the point in tattoos. Just to make yourself feel tougher? To express your toughness to others? To put on a $220 dragon t-shirt that you can never take off? some people think its bad some think its cool everyone is intitled to an opinion. Tattoos don't bother me much, although I don't care for them personally (it's just not my bag). The only thing that freaks me out, is standing next to someone with enough tats to make him or her, the perfect mark for a sniper to shoot at, when I'm trying to be an inconspicuous fellow :-P.
Depends on the age, for most people in my age it is no no. I hate tattoos and dont like piercings. On a piercing you can stop carrying it, a tattoo stays on (i know there are ways with a laser but then it is still visible). A tattoo only looks good if the owner refresh it from time to time, but most people i have seen didn't do that. Spawn could you slap his back for me lol. Give him one....or make it two from me aswell! I have a great tip to make it last longer, rub in fling salt and then rince off with alcogel. 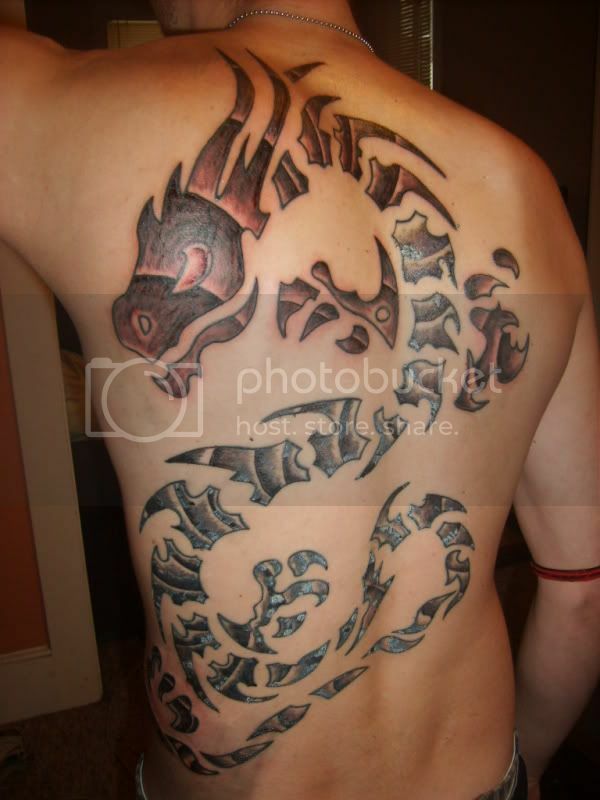 nice tattoo man, im planning on getting one myself once my chest fills out a little more, im asian so i was thinking some sort of arabic design. yeah I'm Bosnian I'm also thinking of getting a tattoo something like a 'fleur de lise" or sword and shield with a "fleur de lise" incorporated on the shield.